Good Morning! This is just the cutest picture. 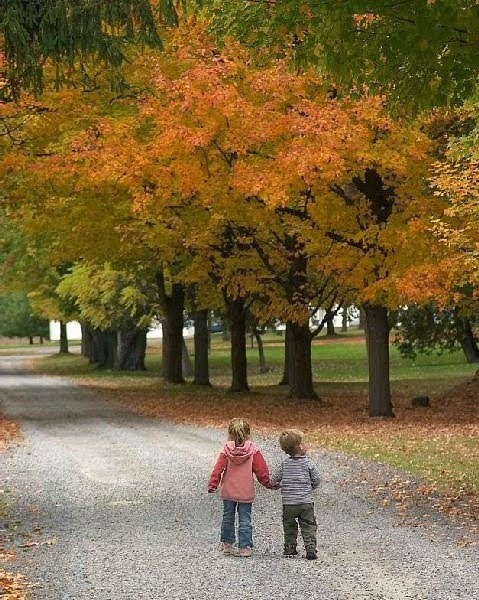 My sister and I loved to jump in piles of crunchy leaves dropped from the oak, maple and poplar trees that dotted our yard. We`d rake them together just to scatter them again. I can hear those tiny feet crunching the gravel on that country lane. Our weather has cooled, no higher than 80 during the day and the nights are divine! Just enough of a chill to make me wrap up in a light blanket. No more AC at night. We had almost no rain this year. Phoenix just a few hours away has been drenched. It`s a struggle to keep my landscape plants alive. I hope we have a very wet winter. I added this small lot of vintage earrings a few days ago to my Etsy shop, thinking they might be re-purposed. They are in excellent condition and with the rest of my collection, taking up space in my sewing room where I need every inch of room. I really do like vintage jewelry. Other than pearl necklaces or a brooch or two, I don`t wear it, just collect it. Pearls were popular in the 1950`s even worn with cardigan sweaters. My grandmother had the most beautiful pearls and rhinestones. I promise you I will have vintage aprons in my blog shop by next week. I`m selling them in small lots. All have some slight defect that is difficult to see so they will be selling cheap. I can`t bear to cut them up for other projects. Most are true vintage gingham with exquisite embroidery. Hi Cathy, I haven't visited for a little while, and it has been very enjoyable catching up on you! That is a cute photo; like most kids I guess, I used to love crunching my way through piles of autumn leaves. I hope I'll remember to look for your aprons in your Etsy shop. I don't go there much, and I go to eBay even less now. I just don't have the money to spend, and besides that, my linen collection room is bursting at the seams, so it would be prudent for me to simply stop buying stuff!